Last week I wrote about the impact of evidence-based communication techniques and then the next day was invited to comment on the results of a new study. It turns out Reaching Women Through Health Information Technology: The Gabby Preconception Care System is a great example of social evidence-based communication and I’ve been waiting for just this kind of new example. New, because, I was already familiar with Louise, the virtual discharge advocate, who facilitates educational processes and gets great marks for patient satisfaction and addressing low health literacy levels. Patients who have been using Louise represent an older and minority population. But, Gabby is targeted at a younger population and she is a risk assessment tool for conception. There is a disproportionate share of young women of demographic minority status and socioeconomic disadvantage with high rates of poor reproductive health and family planning outcomes in the US. 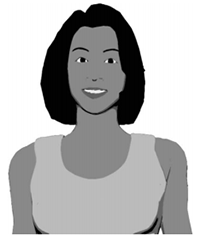 Gabby, an avatar, is an online preconception risk assessment tool that engages young women at a sixth-grade reading level. I know we will see more applications of avatars and virtual patient advocates and welcome anyone that has had an experience with one to leave a comment. The title of the article that I contributed to is “Can Avatars Improve Patient Outcomes?” I say, of course they can… if there is a clear strategy and they are well planned out and implemented.